I’ve been seeing desperate Democrats working to “get the vote out” lately on Facebook and on a handful of liberal online magazines that I occasionally read. Here’s a “cute” example of a graphic used to promote the idea of voting for Democrats on November 2. 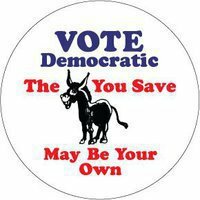 So we should “Vote Democratic” to save our asses? Obama has continued and in some cases made worse the policies of Bush. The Democrats controlled Congress and never truly fought for anything worth a damn. They have been all sound and fury with generous capitulation to special interests on Wall Street and in the Health Insurance industry. Then, once they have sold out any progressive legislation, they either try to make it sound like it’s more than it really is or blame Republicans for obstructing it instead of taking responsibility for their own lack of meaningful action. Voting is a form of control. When you vote for a Democrat or a Republican you are simply legitimizing the control of the ruling class. You are not changing anything. Your voice is not being heard. A small elite group of the population actually has a voice in government – those wealthy and powerful people who fund campaigns, sit on boards of powerful corporations and prestigious universities, and run giant corporations. These people and their sycophants get to rub elbows with politicians and sometimes even get to write the legislation. Voting allows these elites to control the state while appeasing the rest of us through offering the illusion of power. But it is just an illusion. You are just a number. A voting statistic. Put your X here next to Coke or Pepsi. Having a say in the recipe of the beverage that you are forced to consume be damned! Don’t play their silly game. Don’t vote this November. Organize! That’s the only way your voice will ever be heard. Can I get a primer on how to organize? And is this an organized anarchy group or something other? Just curious what kind of organizing you are backing. Also, it seems that you’re dissatisfied with the following benefits that Democrats got passed? Can you expound on which ones you are most opposed to? *Insurance companies will be barred from dropping people from coverage when they get sick. Lifetime coverage limits will be eliminated and annual limits are to be restricted. *Insurers will be barred from excluding children for coverage because of pre-existing conditions. *Young adults will be able to stay on their parents’ health plans until the age of 26. Many health plans currently drop dependents from coverage when they turn 19 or finish college. *Uninsured adults with a pre-existing conditions will be able to obtain health coverage through a new program that will expire once new insurance exchanges begin operating in 2014. *A temporary reinsurance program is created to help companies maintain health coverage for early retirees between the ages of 55 and 64. This also expires in 2014. *Medicare drug beneficiaries who fall into the “doughnut hole” coverage gap will get a $250 rebate. The bill eventually closes that gap which currently begins after $2,700 is spent on drugs. Coverage starts again after $6,154 is spent. *A tax credit becomes available for some small businesses to help provide coverage for workers. *A 10 percent tax on indoor tanning services that use ultraviolet lamps goes into effect on July 1. *Medicare provides 10 percent bonus payments to primary care physicians and general surgeons. *Medicare beneficiaries will be able to get a free annual wellness visit and personalized prevention plan service. New health plans will be required to cover preventive services with little or no cost to patients. *A new program under the Medicaid plan for the poor goes into effect in October that allows states to offer home and community based care for the disabled that might otherwise require institutional care. Israel, I don’t claim to be a gifted organizer, but there are plenty of people who are and plenty of examples of what I have in mind throughout our history. I’m not advocating a particular group, but a kind of organization that is grassroots-based and organizes around issues and gets people to actually do things like marches on Washington, sit-ins in Washington, strikes, etc. I don’t claim to know how to spark the fire in people today, but when I look at the history of the labor movement, the abolitionist movement, and the movement to get the vote for woman – I see plenty of inspiring examples of groups that organized for change and their actions were mass actions of direct pressure – not “get out the vote” activities. Indeed, you can watch the sad degeneration of the strength of the labor movement, as they made alliances of convenience with Democrat politicians. You want a primer? Read Howard Zinn’s “A People’s History of the United States”. it seems that you’re dissatisfied with the following benefits that Democrats got passed? Can you expound on which ones you are most opposed to? Just because I think the Health Care legislations was an enormous travesty doesn’t mean that I’m not aware that it throws a few bones to the base. Obviously, there are some things in the bill that will do some real good for some people, but in the long run it will be bad for them and us. I’ve got my eye squarely on the fact that this bill which was written largely by the Health Insurance Lobby is an enormous give away of dollars to the Health Insurance Industry. First, it mandates that every one buy the shoddy product offered by private insurance. Then, if you happen to be poor and fortunate enough to be recognized as such by the government, the government will give you tax money to buy the lowest plans offered by the private insurance company. The health insurance industry is the heart of the problem with the US Health Care system. The profit motive creates perverse incentives that result in terrible coverage and huge bureaucratic wastes. You don’t solve the problem by bribing the parasitic middle-men to give coverage to more people. You solve it by cutting the middle-men and their profit motive out of the picture. You don’t solve the hideous complexity of our health care delivery system by crafting a hideously complex bill that grafts little regulations here and there on top of a fundamentally flawed system. It’s like the tax system with its complex rules that are full of loop holes. I stand with the Physicians for a National Health Program who saw the Democrats’ health care reform as worse than doing nothing. This bill will result in more tax dollars flowing to subsidize private profits while not fixing the fundamental problems. As a result, despite the nice things you listed in the bill, the health insurance system will still be a horrible experience, people will still go uncovered, and people will be rightly be outraged with being forced to buy health insurance by the government. The stage will be set for Republicans to vilify any government involvement in health insurance and thus set back by years in the public mind the idea of single-payer universal health care which is the real solution. Not only do I find the bill terrible, but I watched the slow train wreck process of how it was crafted on a daily basis – and it wasn’t a matter of evil Republicans forcing the good Democrats to create a toothless bill. The Democrats bent over backwards to appease Republicans from the start even before the Republicans had any traction with a Tea Party movement – and throughout the process they have been the minority party. The Democrats excluded voices for single-payer from their proceedings while inviting the lobbyists for the health insurance industry (who donated heavily to the Obama campaign and to many of the important Democrats in the House and the Senate) in to help draft the bill. And it’s not just the health care bill. The Democrats continued the policies of bailing out the Wall Street gamblers who brought the economy crashing down – instead of nationalizing banks that were “too big to fail”. They screwed over workers in the auto industry while negotiating with the executives. They escalated the War in Afghanistan and the effective wars in Pakistan and Yemen. They continue the occupation of Iraq. Obama continues to aggressively rattle the saber at Iran while there is evidence that his administration continues to covertly undermine governments in Latin America and support coup d’etats there (which has been US policy there for decades). Obama shielded the Bush administration and the telephone companies from the crimes that they committed spying on the American public. Obama has thus far failed to close Guantanamo Bay. The Democrats continue to bend over backwards in competition with the Republicans to see who can collect the most money from AIPAC and pledge the most loyalty to Israel as it commits genocide against the ever shrinking occupied territory of Palestine. The Democrats love to talk vaguely progressive, yet never back it up with a fight. The recent overture at overturning “Don’t Ask Don’t Tell” was pathetic. They attached it to a war funding bill and didn’t call Senator McCain on his filibuster. And they could always change the rules of debate so that the filibuster is no longer a threat – but then they would lose a beloved tool that they like to use, too. thanks for explaining that, John… you have a better solution it sounds like but not a compromising one. Compromise is at the heart of the system… and conservatives wouldn’t even allow 1 vote for this bill… they were wholly opposed so somehow you need a compromise. I agree with everything you’re saying and believe it after watching a few documentaries (one on Nader)… but faced with a devil you know and the devil you hope for… you’re still saying just abstain from voting completely? What about good guys in Congress like Dennis Kucinich. If you were in Ohio, wouldn’t you vote for him? P.S. Regarding your first rebuttle to my post, I think you need to get involved with Quakers. Check out some the Quaker politics and movements on youtube bit I just saw on youtube. I’m thinking of getting more involved with Quakers. Ever read the biography of George Fox? I should clarify myself. I wrote this post more as a polemic against the “get out the vote” attitude I was seeing. While as a rule of thumb, I would say “Don’t Vote”, it is not an absolute position – I am not strictly opposed to voting in all circumstances. I voted in the last election for Ralph Nader for instance. Especially in local elections where your voice actually might be heard, I think voting can be productive when paired with activism. Also, in the context of a powerful independent labor movement where said movement forms its own independent political party, I think it can be strategically valuable to participate in such a Labor party – but always with direct action and public organization in the forefront and voting as a tool for gaining attention and organizing the public into a powerful force for its own interest. The example of Dennis Kucinich is an interesting case. If you’ve read some of my older posts, you’ll see that I’ve supported Dennis Kucinich in the last two Democratic Primaries. He has always held highly progressive positions and seemed a man of genuine integrity. So in the past, I would have whole-heartedly supported him if I had lived within his district. That said, I would likely no longer offer him my support today because I have come to see him (regardless of his intentions) as functioning as useful (for the Democrats) means of getting more progressive forces to join the Democrat tent – i.e. to give their votes to the unprogressive Democratic Party. Kucinich talks a very good game, but when his voice most counts he caves in and asks his supporters to join him in doing so. For example, he was a bold voice opposing the invasion of Iraq and calling for the immediate removal of troops during the lead up to the 2004 Presidential Democratic Primaries. But when the pro-war Kerry won the Democratic ticket, Kucinich asked his anti-war supporters to rally around the pro-war candidate. Kucinich has long been a strong voice for Single-Payer Universal Health Care. However, when his voice actually mattered as means of possibly forcing Obama and the other Congressial Democrats to make the Healthcare legislation less toothless (and keep alive the possibility of state level Single-Payer), he caved-in under pressure from Obama and changed his tune. So I would have to think long and before supporting Kucinich in Ohio. As best as I can tell – despite his talking a lot about progressive politics, he doesn’t seem to actually vote that way when he actually has the potential to affect things. Thus, he functionally serves as nothing more than a way to gather some progressive votes and give a little more cover to the lie that the Democrats represent a progressive force. Regarding the Quakers, it is funny that you should mention them. Back in 2004, when I was attending an evangelical Willow-Creek style church and grappling with the political changes being awakened in me by my finally having read the Bible through all the way and my new conviction that honoring Jesus’s teachings were incompatible with supporting wars, I discovered the history of the Anabaptists and also the early Quakers who had things in common with Anabaptists. My church at the time explicitly supported the War in Iraq, the church had American Flag posters flying inside the church offices, and on July 4th we had a service that was filled with nationalistic self-congratulatory prayers that I found prideful and incompatible with the church’s universal nature and Christ’s call of universal brotherhood. I felt unable to continue attending the church and roughly around this time became aware of a Christian Quaker meeting to the north of Atlanta. While I felt myself more strongly attracted to Anabaptism, George Fox’s ministry did resonate with me and so we began attending there for a year or so. Unfortunately, the dominant force in the Quaker community these days is Liberal Quakerism which is in many ways like Unitarian Universalism where everything is embraced including strange combinations like Atheist Quakers. The largest Quaker meeting in Atlanta is such a meeting and is not a place where I would feel comfortable given that my faith is Christ-centered. The Gwinnett meeting that we attended was started by a Christ-centered Conservative Quaker, but most of the attenders came from the Atlanta meeting and were more in tune with Liberal Quakerism. For me, the church is about Christian fellowship and a mutual strengthening of each other in the faith. Thus, I felt that I was not having this need met there and eventually we left. In addition, I had a lot of trouble practicing the Quaker form of worship which involves sitting in absolute silence for the duration of the service – with the silence broken only when people feel led by the Spirit to speak. Have you attended a Quaker meeting? Currently, we are “churchless” – though I am attracted to the home church movement that seeks to recapture the kind of community described in the book of Acts. I’m not currently aware of any such communities that Melinda and I could easily join although I have a friend who lives in Greenville who is participating in one that sounds cool. great elaboration, John. Thanks. To answer your question, yes, I have attended a Quaker meeting and I, too, found the absolute silence challenging and the unitarian universalist leanings away form the supremacy of Jesus (as George Fox taught).